About the Hike: Plunked in the midst of the Central Oregon plateau, Black Butte looks like a misplaced mountain. A steep but view-packed trail climbs 1.9 miles to the panoramic summit, gaining 1,600 feet of elevation. The last portion of this route is difficult enough that it is not generally recommended for hikers with children. Still, it's surprising how many kids enjoy the climb because they view it as a challenge. Difficulty: A moderate, 3.6-mile loop to the headland's tip gains 900 feet of elevation. Season: Open July through October. Getting There: Drive Highway 22 west of Sisters 5.5 miles (or east of Santiam Pass 13.5 miles) to Indian Ford Campground, near milepost 95. Turn north onto paved Green Ridge Road 11. After 3.8 miles, turn left onto gravel Road 1110 for 5.1 miles to a parking area at the road's end. Hiking Tips: From the trailhead at road's end, the path climbs steadily through a forest of orange-barked old-growth ponderosa pine. The golf courses of Black Butte Ranch appear as miniature meadows in the forest far below. After 1.1 mile, the trail crosses a treeless slope that's white in June with the blooms of serviceberry bushes. Expect other wildflowers, too: big yellow balsamroot, purple larkspur, and red paintbrush. Next the path climbs sharply - a hot, dusty stretch that disqualifies this hike as an easy trip. The trail gains the butte's broad, eastern ridge amidst wind-stunted whitebark pines and follows the ridge up to the top. Do not attempt to climb or enter the lookout structures. The log cabin is the residence of the modern lookout tower's staff; respect their privacy. And bring your own drinking water, as the staff has none to spare. They diligently collect snow each spring and allow it to melt, filling a concrete cistern. 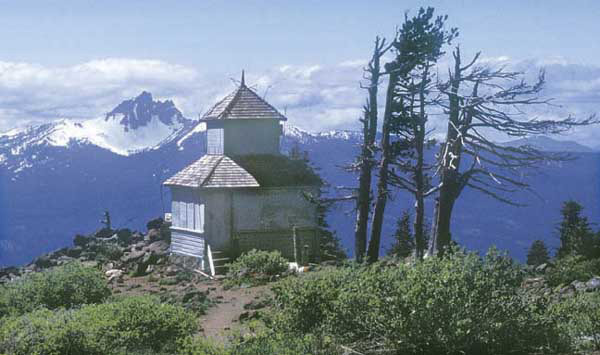 History: Black Butte's unusual placement east of the High Cascades makes it ideal as a fire lookout site. In 1910 one of Oregon's earliest fire detection structures was built here: a simple "squirrel's nest" platform wedged between two adjacent treetops. That original lookout is gone, but Black Butte has collected a variety of other lookout structures since then: an intact cupola-style building from 1923, the ruins of a collapsed 1934 tower, and a modern 62-foot tower from 1995. In 1980 a one-room log cabin was constructed in Sisters, disassembled, and flown by helicopter to Black Butte's summit as living quarters for the fire lookout staff. Geology: As you drive toward the flats of Central Oregon toward this symmetrical volcano, you might well wonder why it erupted here. The more famous High Cascades peaks formed along a fault that has been leaking lava for millions of years. But Black Butte grew along a different, parallel crack to the east. This fault also uplifted Green Ridge's scarp to the north, leaving the Metolius Valley as a long trough. Black Butte began to erupt quite recently, perhaps only 20,000 years ago. It quickly built up a 3,000-foot pile of cinders, one of the tallest such cones in the state. The eruption also buried the Metoilius River, creating Black Butte Ranch's swampy meadows on one side of the mountain and Metolius Springs on the other, where the river now emerges.